Today is your last day to complete November challenges, enter Community Codes expiring today, and collect this month’s Peek A Newz boxes (As a reminder, the uncommon prizes for November are the Medieval Unicorn Tapestry, NEW Raspberry Swirl Painting, and NEW Topaz Mosaic Tile.) ! Remember to vote for Mayor on WKN, too! 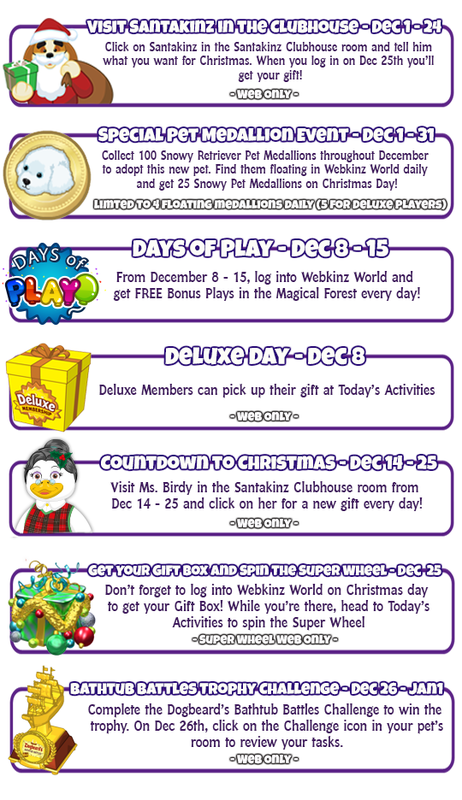 December’s Calendar is full of fun! 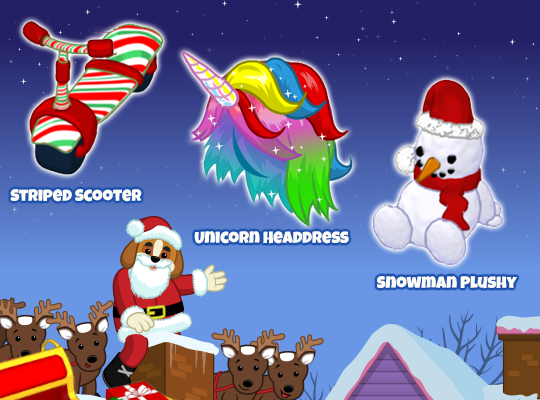 We have the Snowy Retriever medallion collection, new Peek A Newz prizes, Wooly Piglet Room in the Clubhouse, the December Deluxe Challenge, a Design a Medallion Pet contest, & more! I provided links to the various activities I mentioned in the post, so just click around if you want more information. I also created a few closed post before this one on the blog to keep information for future reference. Thanks for all the info, moms!! Looking forward to holidays. a lady i know does this big time……..and with the egg cups and breakfast burritoes for her family………..she will stay up all nite and knock it out……she uses sandwich bags and then for the burritoes she wraps them in plastic wrap and he can grab as many as he wants……….. This is going to be a busy, busy month. I am focusing on the kids who are still playing Webkinz. I might get a retriever for myself, but I think it’s the grands who should get them. They will be Thrilled Christmas morning when I call them and tell them to exchange their coins for their very own Snowy. Pretty sure the others will be lapsing, this year. I am going to do the Deluxe Challenge, even though I don’t need those items, but I know some kids who’ll LOVE the Owl items. And if things work as they did with the Rockers Challenge, I will have a few happy kids. I got the RAINBOW UNICORN HAIR in a cracker . Good morning! Actually, good afternoon! It is 12:06 p.m. here. Wow, MomT! That is so cool! But wait, isn’t that one of the gifts from Santa? Gaga – Thanks for your offer of coins, but I’m loaded on my other accounts. I was truly bummed about WW crashing when I was on Level 13 of Eager Beaver. Dee – That burrito lady sounds amazing. One of my friends makes yogurt cups early in the week for her daughters who are on swim team. She makes her yogurt and adds berries, oatmeal, nuts, coconut/milk, etc. and the girls just grab a cup in the morning and go. Momskinz – Thanks for all the updates, too! I appreciate your time & dedication! MomT – wow! that is one of the santakinz gifts – weird! does anyone know if free accts can pick a present from santa? PumaPasta freezes ok. I sometimes make too much, and end up freezing a portion. It sometimes comes out less saucy, and making partial batches of sauce can be tricky. Or you think “I have a whole pasta in my freezer” and forget to get the things for extra sauce. I think the “stamp the foot” comment was Ruby- about the costume banana that didn’t unpeel. You know, Puma, speaking from the perspective of a Grandma whose daughter and grandchildren play Webkinz? I just LOVE it when my daughter asks me to get a certain pet for either her or her kids. I have no objections, whatsoever. My daughter is having FUN with her kids. It’s an educational site and it’s promoting togetherness, open communication and all kinds of the GOOD Stuff. Those kids will remember ‘Mom PLAYED with us.’ That’s the GOOD stuff, my dear and that’s worth way more than $50.00 for any pet out there …just sayin (hug) Don’t be embarrassed, your Mom is still reveling in the knowledge that you haven’t lost your child-like innocence. I have the same problem Dee free accounts but plenty of pet codes, need to get around to fixing that. Happy December 1st !! Let the countdown begin !! 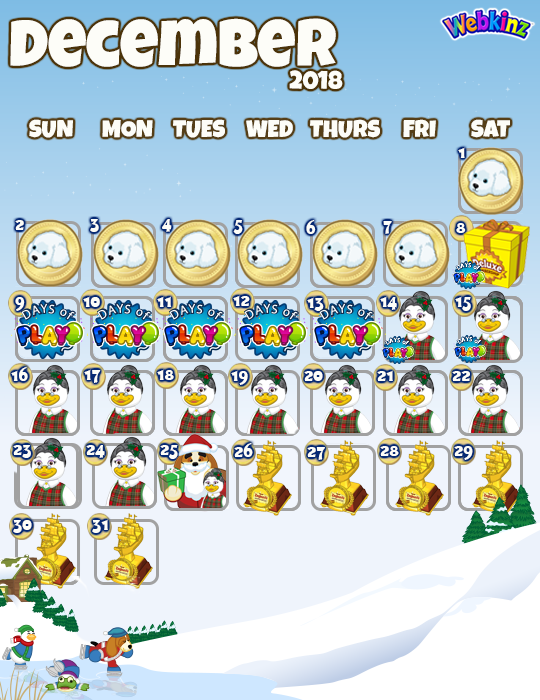 Received all 5 Snow Retriever Medallions on main account… seems like every 6 minutes….I tried on another account and it was giving random pet in addition to snow retriever and I waited at least 15 minutes before a medallion flew by ! moms… can’t believe the CAVS traded Kyle K… not this upset since they traded AV…. but I guess he wanted to be traded… ?? UTAH … are they good enough to win him a championship ring ?? Hope so… he deserves it..
Puma.. so sweet of your mom to get you a Spice Cat !!! Good Morning gramma !! Where is your wishlist ?? Weather here expected to be in the 50’s !!! ?? rain but better than snow. I didn’t have any luck with the pig either. Supposed to be the snow mound. By the time I finished today’s activities the tokens were floating. Good words, Dixie! *hugs* Thanks! I am having issues getting into the room, nevermind even seeing the pig. I do have silver lining, though. I was able to enter my Deluxe membership code with no issues to renew my Asian account. I will have to see if I am successful with my NA, tomorrow. It takes a LOT of wrangling to get it in there, but at least I didn’t have to find a way to call Ganz while I was at work. Is anyone else noticing that only one pet can occupy the new Bunkbed? Puma, I will have PLENTY…I have various scattered accounts and I will make sure, one way or the other that you get one. UPDATE!! 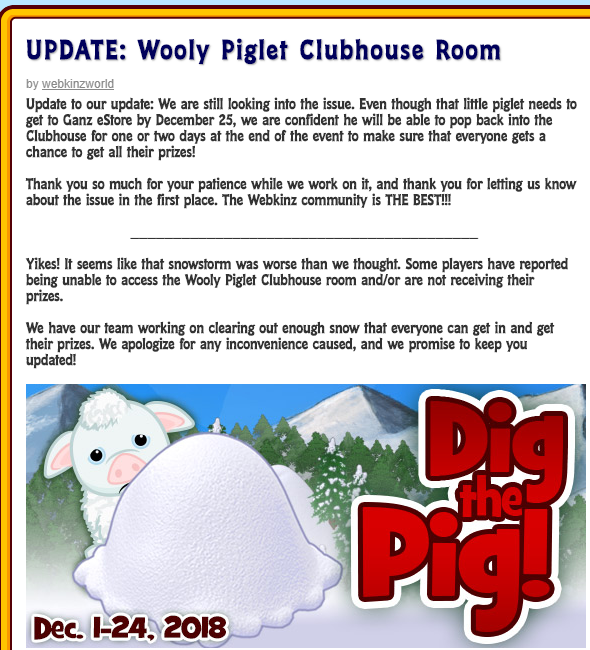 WKN has announced they are working hard on fixing the Clubhouse issue we have been having with the woolly pig!! awwww puma & dixiecup – your comments made my heart all warm & fuzzy! Puma – Congrats on your spice cat. Even if you already have the virtual one, the plush looks really cute! There’s an update for the app that fixes the map issue from before. Very happy about that. One week left of classes and then finals the following week. Lots to do. Gotta finish a paper, lots of reading to catch up on, homework, and a practice test. Can free accounts visit santa to ask for a gift? I’m gonna ask for the snowman plushy on my main account, but if i can, i might make 2 free accounts and try to find a cheap webkinz at somewhere like 5 below… if they still sell them. If not I think i’ll be fine, the scooter and headdress are cute, but i could live without them. They were able to last year Chococat. I had a few accounts that had lapsed and I was able to get in to see Santakinz. They often lift the restrictions so that the free players can have this. It should also be open for Ms Birdy collecting as well. Final update on the Woolly Pig situation, it seems they can’t fix what went wrong, here. So they have an alternate solution and compromise. Monday Afternoon we can go and begin collecting the prizes from WKN, so I am thinking it will either be a floating click or in the events menu like the daily food. They have also stated that they will extend the collecting so everyone gets a chance to get all the gifts. My thoughts on this? I think they tried to create a kind of open filed for the pig because of all the complaints of pets blocking/bullying other pets and it backfired. But kudos, they did try. Beautiful day here today…. at least warm ! Planning on grilling some strip steaks ..for family gathering… Watch CLE Browns hopefully win today ! Dixiecup… thanks for the info on the Woolly Pig Room… maybe it can be fixed tomorrow…..
send your drone for some cream cheese brownies…….but hurry, dh was serious about eating a whole pan!!!! stinks as he is one of them skinny dudes who eats like a trucker……. I got into the wooly pig room today. No pig, just other pets there. I have 10 snowy retriever medallions after 2 days, looks like this might not be that bad. Random thought. If there are webkinz cows, chickens, and fish, why does the wshop sell hamburgers, chicken nuggets, and fish sticks? Cannibalism? lol choco. No, just a food chain. The foxes eat the chicken, the sharks eat the fish, and the wolves eat the beef. Now if someone WANTS to feed their cow a burger they could either pretend its a vegetarian variety or decide the cow is a cannibal. Can’t believe it is Monday already ! Where does the weekend go ! dee.. just read in the WKN that you won’t be able to get the wooly piglet prizes from them until this afternoon… Not sure if it will be a click to win or what exactly they have planned… stay tuned. Snowy Retriever medallions seem to be appearing every 6 minutes…. Heading out later to start my shopping for Christmas…. Hope all is well… and have a good day ! gaga – yes! thanks for pointing out the schedule yesterday because i was able to grab them on my account at least before i went to bed! so far so good on the collection – yay!!! New post will go live in just a little while!